I'm half of duo Fiddlebox, working with musical partner and inspiration George Whitfield. We play at (generally) small and discerning venues, which have this year included Reading Folk Club, The Rising Sun, Reading, The Elm Tree, Cambridge, Cuffern Manor in Pembrokeshire, Burnetts Hill Chapel in Narberth, The Wales Millennium Centre, Fishguard Folk Festival and the National Botanic Gardens. 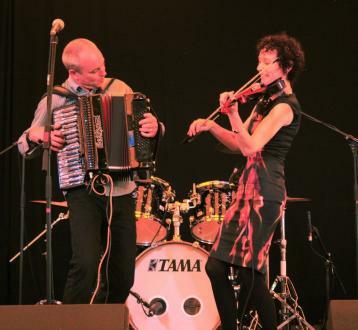 We have a growing band of followers who enjoy our melodically interwoven, rhythmically unexpected, high energy new material and arrangements of Welsh music, Irish music, Americana, Bluegrass and Klezmer. As Fiddlebox we are also often booked as party starters at functions, weddings, family gatherings. We also do an acoustic 'walkabout' act, you will often set us strolling around at food fairs and similar events, showing off much practiced ability to play, talk, walk and eat cheese at the same time! In 2011 I formed our 7 piece family band the Klezmic Rays in order to indulge my passion for playing Klezmer in a big ensemble. As the younger members of the group leave to go to university over the next couple of years, this will re shape into more of a Klezmer collective. I am delighted to be a member of Welsh folk orchestra Y Glerorfa. It's fantastic to play with such a big ensemble of musicians all flying the flag for Welsh traditional music. I also work with other artists on an occasional basis, including harpists Harriet Earis and Carwyn Tywyn. Should you wish, you can book my secret identity, ie Catwoman, as solo walkabout entertainment at your event. 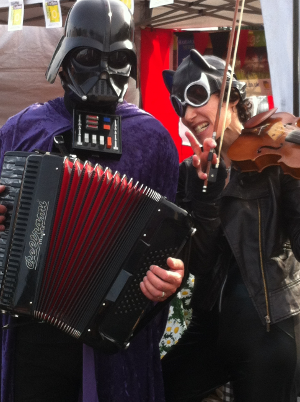 This act is called 'Cat on the Fiddle', seen here consorting with arch-villain Darth Vader from another universe.